Non-tinted. Gentle enough for even the most sensitive skin. Uncompromised aesthetic elegance. Soft, sheer matte finish. Non-Comedogenic. Water resistant (80 Minuets) Mineral sunscreens reflect/ refract UV rays away from the skin. See Label for Inactive ingredients and other information. Non-tinted moisturizing ingredients combined with Zinc Oxide for a Soothing Sunscreen. FREE of chemical sunscreen filters, dyes, fragrances, and preservatives. Gentle for even the most sensitive skin. Broad Spectrum SPF40. Water Resistant (40 Minuets. N-on Comedogenic. Contains Antioxidants C & E. See Label for Inactive ingredients and other information. 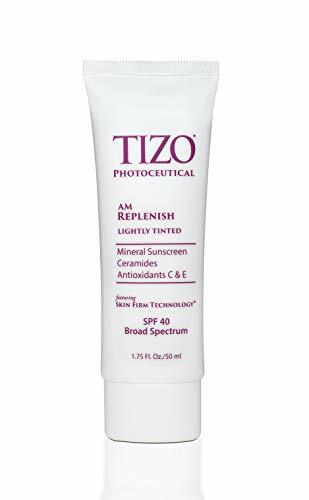 TIZO Photoceutical AM Replenish Tinted SPF 40 Sunscreen 1.75 fl. oz. AM Replenish is specifically designed to helps to repair, protect and revitalize environmentally distressed and photo-damaged skin. It helps to prevent sun damage that causes wrinkles, sagging and loss of firmness. Oil-free EltaMD UV Clear facial sunscreen is recommended by dermatologists because it helps calm and protect sensitive skin types prone to acne, rosacea and discoloration. This tinted mineral-based face sunscreen is lightweight and silky. TIZO Photoceutical AM Rejuvenation Day Cream, 1 fl. oz. 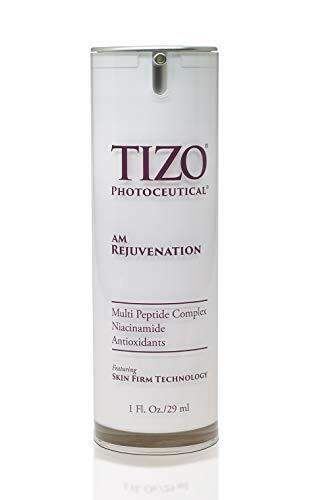 TIZO Photoceutical AM Rejuvenation Day Cream, 1 fl. It is specifically designed to helps to repair, protect and revitalize environmentally distressed and photo-damaged skin. Tazi address skin's tone and texture while simultaneously aiding in the prevention of future photo-damage. Tinted Moisturizing ingredients combined with Zinc Oxide for a Soothing Sunscreen. Ingredients - bismuth oxychloride, c12-15 alkyl benzoate, caprylhydroxamic acid, caprylyl glycol, cetyl peg/ppg 10/1 dimethicone, cyclohexasiloxane, cyclopentasiloxane, dimethicone, dimethicone crosspolymer, dimethicone/vinyl dimethicone crosspolymer, dimethiconol, disodium edta, glycerin, iron oxides (ci77491, ci77492, ci77499) hydrogen dimethicone, mica, microcrystalline wax, peg-10 dimethicome, peg-30 dipolyhydroxystearate, polyglyceryl-4 isostearate, polyhydroxystearic acid, polysorbate 20, sodium chloride, stearyl dimethicone, tetrahexadecyl ascorbate, tocopheryl acetate, triethanolamine, triethoxycaprylylsilane, water. Ease application for protection against all the sun's UV rays. Excellent for thin and sensitive skin- lips, nose, ears. Free of chemical sunscreen filters. Moisturizing ingredients combined with %20 Zinc Oxide for a Soothing Sunscreen. Get powerful sun protection without the heavy finish with Neutrogena Ultra Sheer Dry-Touch Sunscreen. This Broad Spectrum SPF 100+ sunscreen lotion with Dry-Touch technology absorbs fast for a clean, ultra-light feel and shine-free finish. This sunscreen is formulated with Helioplex Technology, which offers superior broad spectrum protection from aging UVA rays and burning UVB rays. Fast-absorbing and water-resistant, this non-greasy formula is non-comedogenic and PABA-free. Compare prices on Solar Protection Formula at Elevelist.com – use promo codes and coupons for best offers and deals. We work hard to get you amazing deals and collect all avail hot offers online and represent it in one place for the customers. Now our visitors can leverage benefits of big brands and heavy discounts available for that day and for famous brands.